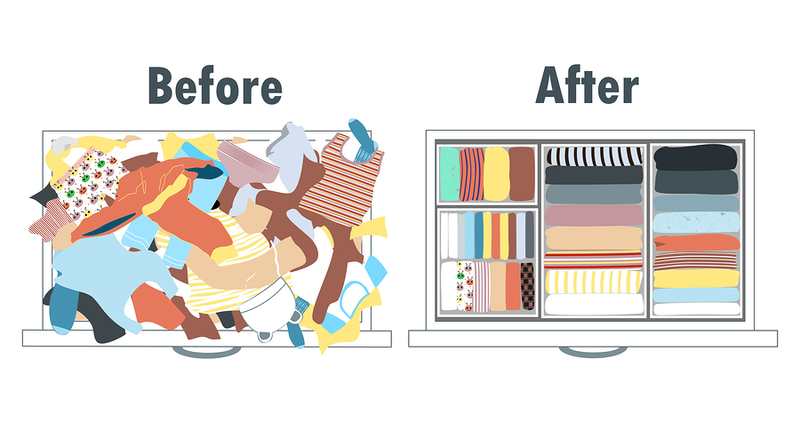 WHAT CAN KONMARI™ DO FOR YOU? The KonMari Method™ is an organizational/tidying method that encourages tidying by category, and encourages the organizer to keep only those items that spark joy. While this particular method is currently “trending,” there is much to be said about the positive effects decluttering can have on one’s mental health. Mental health research has proven that decluttering can decrease feelings of anxiety, stress, indecisiveness, and insecurity brought on by excess and disorganization. Decluttering can also improve physical health by removing items that may trap dust and toxins from the air. Making space for your things can also improve your health by creating a more conducive place for you to meal prep and or try a new exercise. 1. Choose your method. Whichever organizational method you choose try and stick to it so that you are not overwhelmed. Whether it’s KonMari, or The Minimalists or another tried and true method make sure your first step is to stay committed to your work. 2. Be kind to yourself during the process. Most clutter is a result of learned behavior acquired during our childhood and adolescent years. Practice gratitude and speak positive affirmations about the new perspective you are adopting with respect to inanimate objects. 3. Don’t give up! Behavior change is a process so do not be discouraged if you find yourself resorting back to old habits. Learning to be organized is a process that gets easier with practice.